We have talked a lot about not relying on open-rates as a final metric for judging the effectiveness of your email campaign. We have always stressed using rigorous and conclusive numbers, like revenue per email or conversions per email. However, at the end of the day, if your email isn’t opened, then your recipients aren’t converting, and your revenue per email is non existent. So email open rates are important to keep track of, right? Right, but email open rates are more important for the trends they show than for the actual numbers themselves. As long as opens are going up relative to your baseline, you know that you’re doing something right. If they drop precipitously for a particular email, you should look at what was different about this email. These differences can help you form some hypotheses and you can test these through email experiments. The same goes for if you try something new and notice that your email open rates increase. So while we caution you not to put too much emphasis on open rates, they are still a very important factor in email optimization. Factor: Recency to last interaction – the less time that has passed between when the recipient interacted with your website and when they received your email, the more likely they are to open it. 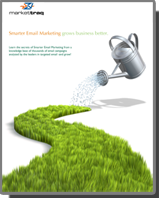 Solution: Email marketing automation. The best way to minimize the time between interaction and email is to have emails that are triggered by actions taken by the recipient on the website. Factor: Recognition of the sender – the more familiar recipients are with you and your brand, the more likely they are to open. Solution: Use the same “from” name for all mailings to build up familiarity. If you can, make it more personal than just “info” or similar. Some suggestions would be using your own name, or even the name of the company. Factor: Subject line – the subject line is the first (and unfortunately in most cases, only) part of your email that most readers see. Get them hooked early. Solution: There is a trend in email marketing to downplay the subject line, or make it as concise and straightforward as possible. This isn’t always the best approach. Sure, you can make it simple and say, for example, “25% off all orders until Friday”, but does that really stand out from the hundreds of emails people get daily? Make the subject line interesting and clever, without hiding the meaning. Factor: Urgency – the more pressing and urgent your email seems, the more likely it is to be read. Solution: You don’t want to overdo the urgency angle, the more you use it, the less striking it becomes. Still, it doesn’t hurt to have flash sales or advertise limited offers now and again. The bump in open rates might be temporary, but it will help future messages avoid getting filtered by smart inboxes. Factor: Time of Day – between 70 and 80% of all email opens happen within the first hour of sending. After that, the email becomes more and more buried and difficult to get to. Solution: First and foremost, segment your list by open times. Send emails to people when you know they’ve opened in the past. Second, avoid email rush hour. For years, email marketers have been talking about sending emails early in the morning, to the point where many of them get lost in the shuffle. Look at afternoon and even evening to catch people when they aren’t overwhelmed by other communications. Factor: Look and Feel – many email readers have a preview pane that let recipients check out the email before reading/opening it. Eye-catching emails get opened more often. Solution: Design your emails well, and make sure that you optimize the look for the most common preview panes. Use bright bold colors and don’t scare off readers with the metaphorical wall of text. What is great is all these solutions are at your fingertips with MarketTraq!